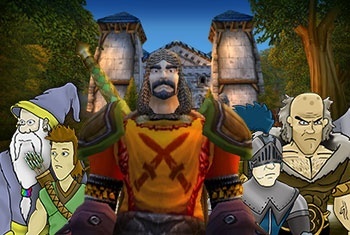 Join Doraleous and Associates on WoW RP/PVP server Lightninghoof on July 16 from 4-6pm EST! We will be meeting at the front gates of Stormwind before doling out justice in Azeroth. Last week Doraleous and Associates found themselves teleported to Azeroth after blindly following Neebs for a job. They are now stationed in World of Warcraft on the RP/PVP server Lightninghoof to help those paralyzed by fear, struck down by oppression, and losing their grip on freedom. This Thursday, you will find Doraleous, Neebs, Mirdon, Walken and Brouf at the gates of Stormwind City at 4pm where they will fill you in on the days epic plans. * Request to join the guild "Doraleous and Associates" and you could have the opportunity to play with them at any random moment! You might even meet other Doraleous members to adventure with in-between sessions. Also, somewhere in Crystal Lake lies the mysterious Lady of the Lake: If you can find and summon her through renditions of "Laddyyyyyy" you may be lucky enough to receive the almighty Zephyr Blade. Doraleous and Associates (on WoW) is open for business! *In order to participate this week you will have needed to have completed your Elwynn Forest and Westfall quests!